Skype updated its Android app to version 4.0 today, rolling out an all-new design that removes much of the clutter associated with previous incarnations. The home screen is now split into three separate tabs for accessing recent conversations, specific contacts and ‘favourites’. Dialog trees look much cleaner than before, although senders’ messages are still differentiated with a light blue background. Recipients are acknowledged with a small, circular crop of their profile picture this time around and there’s still the usual array of emoticons and smiley faces to help portray a particular feeling. It’s also possible to attach a file from the user’s Android device, as well as individual video messages; something that Skype recently launched as a full-fledged feature for almost all of its native apps. The aforementioned circular profile pictures are also prevalent when the user makes a call. The design here is flatter than before, with three icons at the bottom of the screen to pick up with a video call, use audio-only or simply hang up. The caller is shown with Skype’s renowned white bubble around them, along with their name and the word ‘Calling’ underneath. 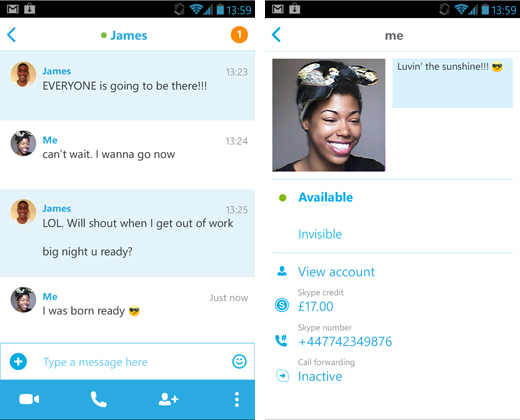 Skype says the updated Android app is “faster, lighter and even easier to use”. There’s no new features to speak of, but the overall design has been revamped to simplify the experience and brighten up some of the more dreary parts of the service. A refresh couldn’t come soon enough, given the multitude of cross-platform messaging apps vying for market share at the moment. WhatsApp and Viber, alongside LINE, Kakao Talk and Cubie from Asia are but a few of the alternatives with their own, slightly different take. BlackBerry also plans to launch its BlackBerry Messenger (BBM) service on iOS and Android later this year, while Google continues to promote its new Hangouts app across iOS, Android and Chrome. The update hasn’t hit the Google Play store just yet, but it’s only a matter of time. Watch this space.